The session started with a welcome note and introduction of speaker, Mr Shray Agarwal , working as Business Analyst with Quantum Consumer Solutions. .
Mr.Shray started the session with the introduction to the concept of Guesstimate. Following were the main points related to GUESSTIMATE that were discussed . Demand Forecasting and Guesstimate- Both are related terms that are used for Sales majorly and the difference lies in their range of applicability. Demand Forecasting is used in broader sense that means predicting future demand for the product or a service on the basis of the past events and prevailing trends . 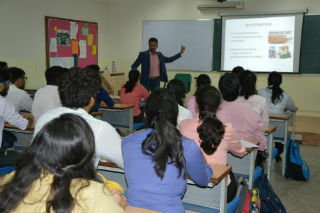 He discussed commonly used facts related to market research. He explained the concept taking examples from Telecom Industry and how JIO become the strongest player in telecom market which was dominated by Airtel and Vodafone earlier. Post discussion, a Case Study related to “The Lion Brewery” was presented for discussion. It was our privilege to attend a very informative and interactive session by him. His ideas and concepts about marketing research sparked as a lively session for all of us. He told us about the facts that are prevailing in existing market. This was actually practical experience sharing session. Hope to attend his session again.